NASHVILLE, TN-More than an induction in the Country Music Hall of Fame two blocks away, the true barometer of success in country music is getting your snapshot on Tootsie's Wall of Fame. Now Peavey, another Nashville fixture, is backing country music hopefuls in addition to the 200 or so local session pros and stars who endorse its musical equipment. That's because Tootsie's star-making stage now boasts a pro audio system from Peavey and Crest Audio. 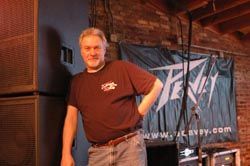 Bobby Phillips, Tootsie's front-of-house engineer, relies on Peavey QW loudspeakers to bring the same quality sound for writers, pickers, and performers who make the pilgrimage to Nashville today as it has since opening in 1920. But Peavey is no stranger to Tootsie's. In fact, when audio consultant Kent Morris showed up with a truck full of new Peavey QW loudspeaker enclosures and GPS power amplifiers for the main room, front-of-house engineer Bobby Phillips directed him to a rack containing a few familiar relics. "The old system was a pair of 450-watt Peavey Black Widow 18-inch subs," said Phillips. "Those original speakers from the 1970s." A stack of 20-year-old Peavey CS 800 and 1000 amps were also part of the old guard at Tootsie's stage, an 18-foot-wide by 20-foot-deep platform positioned in front of a 25- by 25-foot seating space. At the heart of the new system is a 24-channel Crest Audio HP-Eight mixing console. Phillips said that regardless of the number of performers on stage, he is able to accommodate them with this single console for both mains and monitors. "I'm running five monitor mixes-one set of in-ears and four wedges-and I typically run 16-20 channels depending on the size of the act," he said. The 8-bus HP-Eight console's Fader Flip function is central to his streamlined approach. Phillips can see the levels going to the stage by simply pressing a button that sends the Aux masters to 100mm faders in place of groups and L/R. "With Fader Flip," he pointed out, "instead of using the Aux send [for monitors], I can flip down to the faders on the groups and actually get meter readings on my monitor sends. It's a wonderful thing." A complement of 10 Peavey GPS (Global Power Series) amplifiers deliver the signal to two sets of QW loudspeakers and monitors. At both stage left and stage right, a GPS 900 powers the high end of a QW 1, while a GPS 2600 powers the mids. Two GPS 3500 amps drive a QW 215 and 218 subwoofer each. Monitors are QW ML and QW MR models pushed by GPS 1500s. Phillips said he decided to use the QW Series enclosures because of Peavey's patented Quadratic Throat Waveguide technology, which reportedly eliminates distortion caused by high sound-pressure levels. As Morris explains, audio originates at two different points within speakers having rectangular horns-such as 60 x 40 degrees or 90 x 40 degrees-because the vertical and horizontal axes are not aligned. The transition from driver to horn wall in these speakers causes distortion.